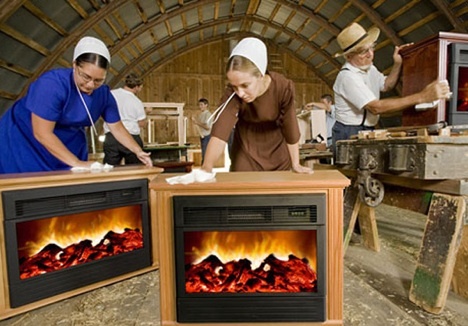 I just saw this infomercial for Amish heaters. The main selling point is that Amish people make them. The second selling point is that they save you money. In the ad they show a box with a heater inside being placed on an Amish horse-drawn carriage, one box at a time. Does this mean the horse and carriage go to the post office in Pennsylvania, and then the box is put on a plane. Or does this mean the horse and carriage will show up at my apartment in LA? I read this one aloud in the law school bookstore & it got lots of laughs. But what about the fact that the ELECTRIC heater goes against all the tenents of Amish life? Can we say oxymoron?